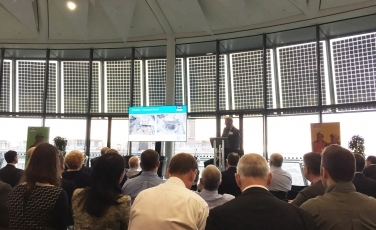 The UK’s Federation of Piling Specialists (FPS) recently held a conference on 10 November 2015 to share the geotechnical lessons learnt from Europe’s largest construction project – Crossrail. Crossrail involves building two railway lines, east to west across London to a depth of 40m below the historic centre of the city. Costing £14.8bn (€21bn) to deliver, when complete it is expected to increase the public transport capacity of London by 10%. Recently the 42km of tunnelling works were completed, bringing to an end the geotechnical phase of the project and it was decided to organise a conference to discuss some of the many issues raised during this phase. The event was organised jointly between the FPS and Crossrail, and is the first such event in the UK where a client organisation has collaborated with the FPS to share knowledge with the wider industry. The event was held in the prestigious City Hall building on the banks of the River Thames. It included sessions on the construction methods used in challenging ground conditions, specification and design verification and equipment and innovation. A panel discussion was held on the commercial aspects of the project which involved main contractors. It was concluded from this discussion that it would have been beneficial to have an earlier involvement of contractors and specialist contractors to help solve the challenges on the project. EFFC President Hans-Joachim Bliss concluded the day sating: “It is impressive that foundation contractors and the client can share openly the challenges and solutions they developed on the project. It is an approach that could be beneficial in Europe if it is adopted in our Member countries. Having now identified what needs to be done both technically and in terms of the commercial approach, it only remains for everyone to implement these solutions to create a better experience and result for everyone.